Motherwell slumped to just their fourth league defeat of the season in a 1-0 reverse to Hibernian at a windy Fir Park on Saturday. Martin Boyle's first half strike was enough to defeat a Motherwell side who looked flat in their first Fir Park appearance since beating Rangers in last Sunday's Betfred Cup semi-final. Hibs produced the first effort on goal on 19 minutes when Boyle's shot was well saved by Trevor Carson. And it was the Hibees who broke the deadlock eight minutes later when Boyle tapped in after rounding Carson following a long ball over Cedric Kipre's head. The Edinburgh outfit then had another effort but Brandon Barker's shot from outside the box was deflected wide. A rare good move from Well in the first half ended with a fine Allan Campbell effort from distance that didn't miss the Hibs goal by much. Motherwell manager Stephen Robinson reacted to his side's below par first half display by making a double half-time substitution with Gael Bigirimana and Craig Tanner replacing Carl McHugh and Elliott Frear. And the little Burundian midfielder was involved straight away as Bigirimana hit a controlled volley which was too straight at Hibs keeper Ofir Marciano. Bigi was then centre stage again when he seemed to jump into Boyle at the edge of the Motherwell penalty area but referee Bobby Madden gave nothing. 'Well kid Allan Campbell was booked for a foul on John McGinn, before Robinson made a third change by bringing on Lithuanian first team debutant Deimantas Petravicius for Andy Rose. Kipre battled hard to win the Steelmen a free-kick just right of the penalty area and Tanner's whipped left footed delivery didn't miss the far post by much. Motherwell came agonisingly close to equalising after 70 minutes when a brilliant Bigirimana pass set cadden away down the right and his brilliant cross was met by Petravicius at the back post. But his effort was blocked by Steven Whittaker. There then followed a frantic period of action as 'Well had a penalty shout denied for Marvin Bartley's apparent handball, before Motherwell had the ball in the net when Charles Dunne shot home from close range but the 'goal' was correctly ruled out for offside. 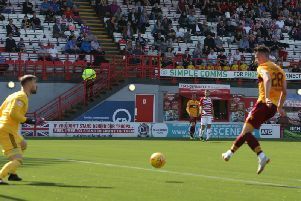 Motherwell defender Peter Hartley - thrown forward late on as the Steelmen tried for an equaliser - was in defensive action as he made a late block from man-of-the-match McGinn's shot. Hibs employed time wasting tactics in the far right corner to see out a largely scrappy game which sees Motherwell drop down to fourth place in the Scottish Premiership but still above Hibs on goal difference. Motherwell: Carson, Hartley, Cadden, McHugh (Bigirimana 45), Moult, Frear (Tanner 45), Bowman, Rose (Petravicius 53), Dunne, Kipré, Campbell.